Remember that little sneak preview I showed you last week? I finally uploaded enough pictures to tell you the whole story! This is easily the largest sewing project I've ever done all by myself, and I can tell you it involved A LOT of research and scanning the web for tutorials! It was so rewarding to teach myself everything from scratch! The result? My very first memory quilt! 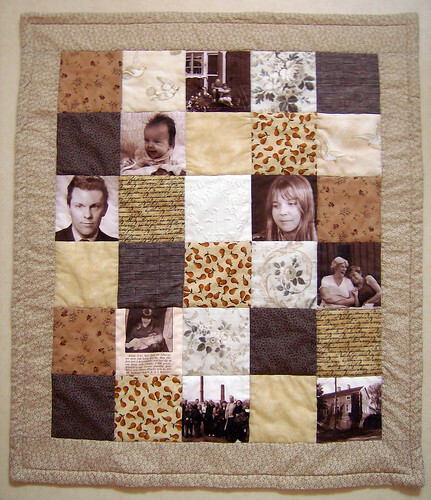 The idea of making a memory quilt for my mom came into my head about six months ago. Both my grandparents passed away last year after being sick for a long time, so naturally it has been a rough time for her and for the whole family. 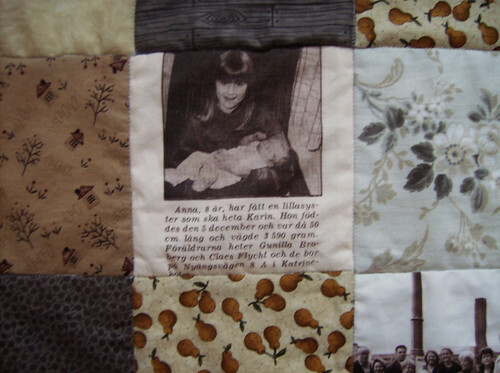 For me, working with this quilt was a good way of seeing past all the sadness and remembering all the wonderful things about our family. I wanted it to reflect happy memories, so that she (and all of us) could look at it and remember all the good times. 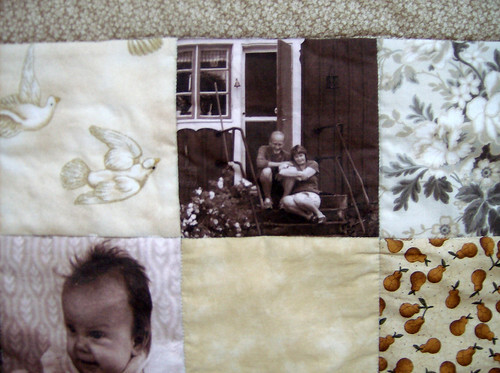 The last one is not a photo, but I think it's my favorite square in the whole quilt! It is cut from an old pillow case, embroidered by my great grandmother! It shows her initials, MB, and it's got to be around 70 years old. I can't believe how many times this has been washed, and the embroidery still looks perfect! 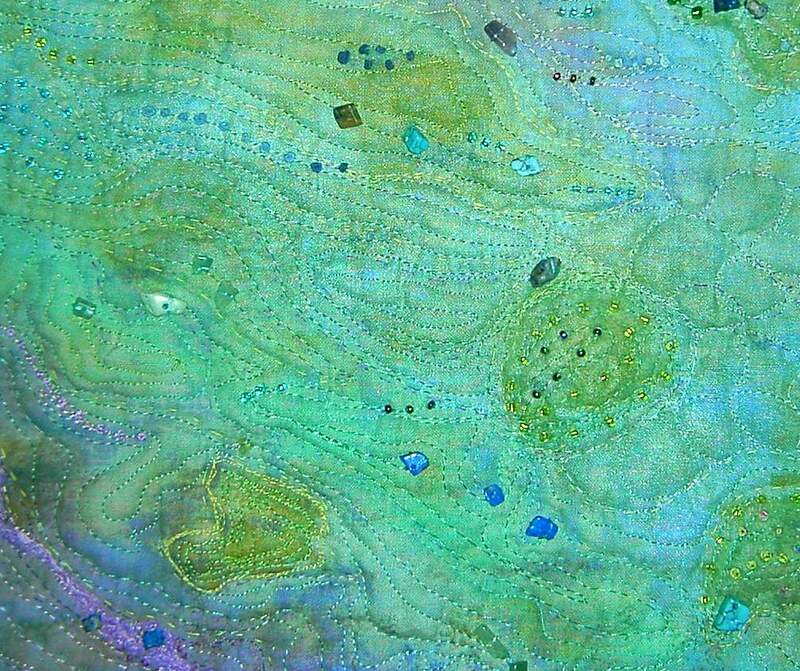 I was so happy that I managed to incorporate it into the quilt, I really feel it adds another dimension to it. This is a picture of the back. 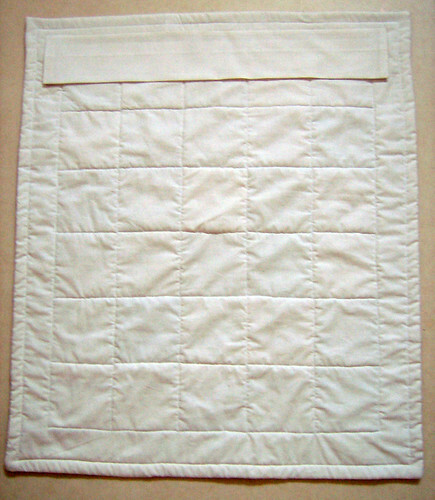 I used fleece as batting, because I didn't want the quilt to be too "fluffy". After machine quilting the layers together, I used this great tutorial to make the hanging sleeve. It turned out great but all that hand sewing was such a pain! I wanted the stitches to look nice and neat (my mom is a textile crafts teacher so I just knew she would look...) plus you have to be really careful not to stitch through the quilt top. I made that mistake once and had to rip out several inches of tiny stitches... 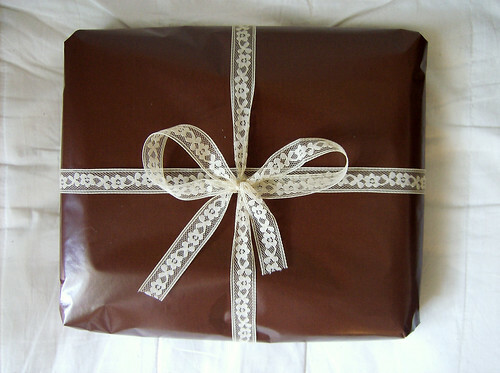 I barely finished in time to wrap it up before my mom arrived! When it was finally done I just sat and stared at it for a while, I was so pleased! It was a bit hard to give it up after having spent so much time on it, but I know it will be loved in its new home! I'm planning to visit my mom in July to check out her new sewing studio, so hopefully I'll be able to show you what it looks like on her wall (did you put it up yet, mamma?) then! Whew, what a long post! I hope you didn't fall asleep halfway through? I'm so excited about finishing this project, I could go on about it for hours... But I've got to get up early tomorrow (the flea market beckons!) so I really can't spend all night blogging. Shame! :-) Have a great weekend! Holy moly! That is gorgeous! What a wonderful gift full of memories. what a beautiful tribute to your grandparents and your mom. beautiful. 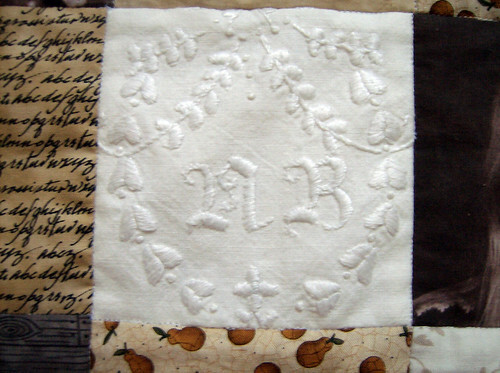 Thank you for stopping by my blog.Your quilt is amazing! What a beautiful tribute to your memories. I've been doing some researching about quilting myself - for some reason I feel really drawn to giving it a try. This Quilt is just so beautiful and inspiring. I love your quilt!!!!! I have been playing with the idea of fabric scrapbooking in my head for several months now.I will be sure to check out that EQ printables when I get close to the real project. You didn't share your moms reaction? I'm sure she was thrilled with such a thoughtful and memorable gift. Thanks for sharing! Wow, your quilt is beautiful! The colors you chose compliment the pictures so well. I just hopped over from the comment you left me, and am loving reading your blog; thanks for the great crafty inspiration! What a wonderful idea! I might steal it if that's ok, to make one of my own at some stage! 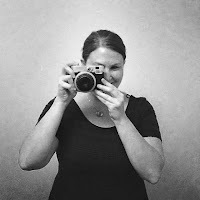 your blog is lovely by the way.